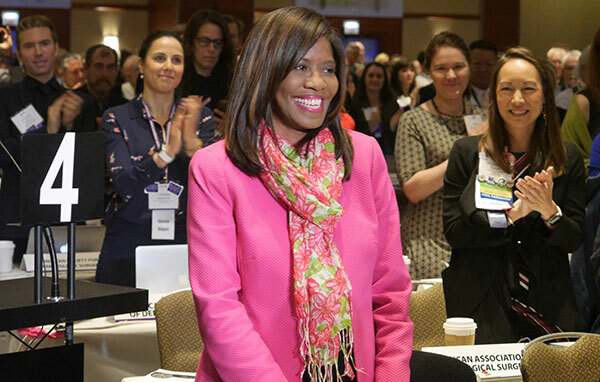 APA member Patrice Harris, M.D., M.A., a former APA board member and AMA board member, was elected today as president-elect of the AMA during the AMA’s House of Delegates meeting in Chicago. Harris is the first African-American woman to hold the office. Harris served on the AMA Board of Trustees beginning in 2011 and served as secretary for the 2014-2015 term and as chair of the board for the 2016-2017 term. As a practicing psychiatrist trained in child/adolescent and forensic psychiatry, she consults with both public and private organizations on health service delivery. She is also chair of the AMA Task Force to Reduce Opioid Abuse and is an adjunct assistant professor in the Department of Psychiatry and Behavioral Sciences at Emory University. Harris previously served as the director of health services in Fulton County, Ga., and the head of the Fulton County Department of Behavioral Health and Developmental Disabilities. As chief health officer for Fulton County, she spearheaded efforts to integrate public health, behavioral health, and primary care. She is a past president of the Georgia Psychiatric Physicians Association.